Drones are becoming an important part of armed forces across the world. Drones have been effectively used in many war situations. Most armed forces have used fixed drones. But these drones have some disadvantages. For example, they have a very high stall speed and they cannot hover over a point of interest or maintain position with respect to a slow-moving object such as a ship or truck. Further, the conventional drones do not use space efficiently. US Navy has developed a unique drone that can be stored and launched from a tube. 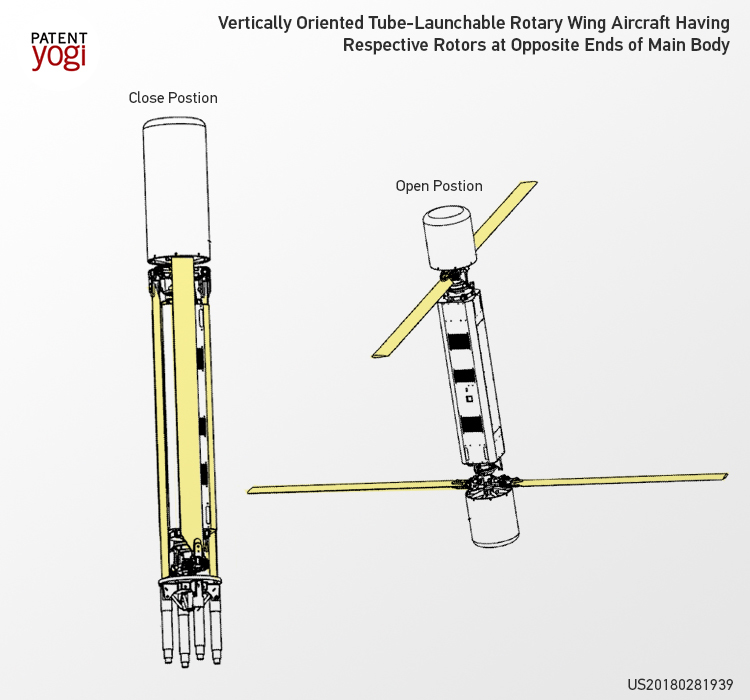 The PatentYogi team has discovered a patent application from the US Navy that discloses details of this unique drone. The patent application discloses design of an expandable rotary wing unmanned drone. The drone is capable of being stored in a cylindrical housing like a tube. The drone includes a longitudinally extending body with a pair of counter-rotating coaxial rotors each located at the two ends of the body. The drone can be launched directly from the tube vertically into flight within seconds on receiving a command. The figure below shows the drone in a closed position (inside the tube) and open position (after launch). The unique design provides the ability to store the drone in space efficient manner for long time periods, yet it can be launched into flight within seconds whenever needed. Therefore, the drone is volume efficient, simple, cost-effective, and it maximizes the payload volume and weight possible for a given size tube. Further, these drones may be launched from land, sea, and air platforms. Possible missions for such drones include electronic warfare, military reconnaissance, precision ordinance delivery, law enforcement surveillance, intelligence gathering, precise sensor delivery, hazardous area inspections, environmental monitoring, etc. The drone can be launched in several ways. One launch method includes using a compressed gas to push the drone out of the tube to sufficient altitude such that the rotors can spin up to speed and the drone can start flying in mid-air. The use of a sensor electric motor propulsion system enables the rotor to spin up to flight speed in one second. The launch tube may use sealed commercial carbon dioxide cartridges to generate high pressure. Further, a solid rocket motor could also be used for launch especially if higher initial altitudes are desired. The drone design is also suitable for deployment from an airdrop. From high-speed aircraft, a parachute can be used to slow the canister down before the drone is released into flight. US Navy is also raising an army of ocean drones. So what do you think about this drone technology from the US Navy? Let us know in the comment section your view on this revolutionary invention.